Learn how we use Active Portfolio Management to help you earn consistent and attractive returns, while protecting against significant market declines. We are hands-on money managers. Learn what that means for you. Learn how we look at all parts of your financial life to help you plan to achieve your lifestyle goals and maintain financial security. Are your investments performing as well as they should be? Are you invested in the right kinds of stocks, bonds, and other securities for your investment goals? How will your portfolio perform in a bear market? Is your portfolio managed in a tax efficient manner? These are the kinds of questions we will address in our Second Opinion Investment Review. Click here to learn more. How retirement ready are you ? Schedule your complimentary financial review. Pacific Investment Research is a boutique investment advisory firm that provides financial planning and investment management services to investors throughout California. We have more than 25 years of experience helping individuals and couples accumulate and preserve the assets they need for a secure financial future. As fee-only fiduciaries, we put our clients' best interests first. 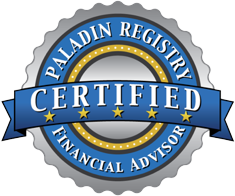 Click Here to view Paladin’s research report for this professional or firm. © 2019 Pacific Investment Research. All rights reserved.